Resistance Band to exercise is one of the athlete’s most important sports tools to strengthen muscles. The rope of resistance contributes significantly to strength and muscular endurance. It is for women and men. Your mini club with this wonderful range of resistance-resistant rope. These exercises may be part of a series of strength exercises that contribute to increasing muscle strength and carrying greater weights and muscle growth, or endurance exercises that contribute to the exercise of the muscles, such as abdominal muscles, back pain, In increasing muscle bearing so that it performs a higher number of repetitions with muscle strain. Very suitable for all ages and races. Length of rope 120 cm. 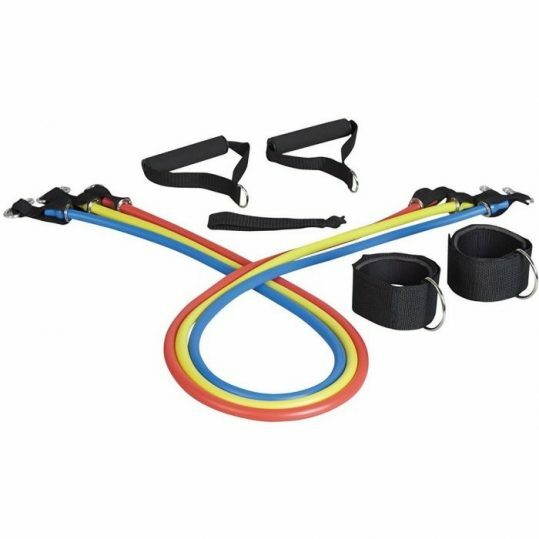 It consists of 3 ropes resistant: light, medium, heavy. Comes with an ankle link for buttocks and thigh exercises. Great and strong Pullup bar you can easily install it on your door.